We were surprised at how many request we received to make armor accessories for the OTV and IOTV body armor carriers. 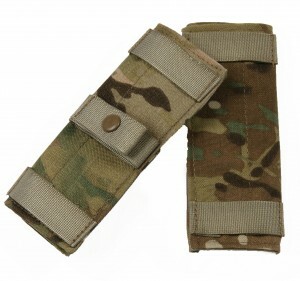 The armor accessories designed for the OTV and IOTV carrier are interchangeable. The only armor accessory we don't make is the yoke/collar. The reason for this is that the soft armor inserts is not removable. OTV/IOTV DAPS – The deltoids protectors provides for additional protection to the upper arm and underarm areas. The protectors will attach to all BCS I carriers. OTV/IOTV AXILLARY – The axillary protectors provides for additional protection from fragmentary and projectiles to the underarm areas. OTV/IOTV THROAT PROTECTOR – support the soft armor inserts and attaches to the collar. LOWER BACK PROTECTOR – Lower back protector attaches to the BCS IOTV line of carriers. The lower back protector extends the vest's coverage by 52 square inches and provides additional protection for the lower spine and pelvis.The lower back protector assembly attaches to the inside of the back carrier using two nylon webbing straps. The lower back protector outershell can be made with or without MOLLE webbing. NAPE PROTECTOR – N.A.P.E. 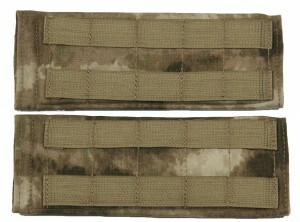 (Neck Armor Protective Enhancement) Pad carrier Universal Mount Model 1, this carrier is mounted to the MICH ACH (Advanced Combat Helmet) shin strap and designed to support the protecting armor against fragments from ground-level threats while adding stability to the helmet, with no minimal weight and minimum bulk possible. This is only the carrier and supports the NAPE armor insert. The carrier is 100% cordura. Plate carrier waist pads are perfect for those that need to have molle attachment on the hip but don't want to run a full cumber. Shoulder pads are available in 4,6 and 9 inch sizes. Our shoulder pad have a snap/webbing loop to retain a weapon slings. This helps prevent sling neck burn.